Most of the time I like to think I’m a positive chap, or at least I’m generally cynical in a cheerful kind of way. But every now and then I have one of those moments of clarity that makes me question just what the hell I think I’m doing for a hobby. Take this evening, for instance. 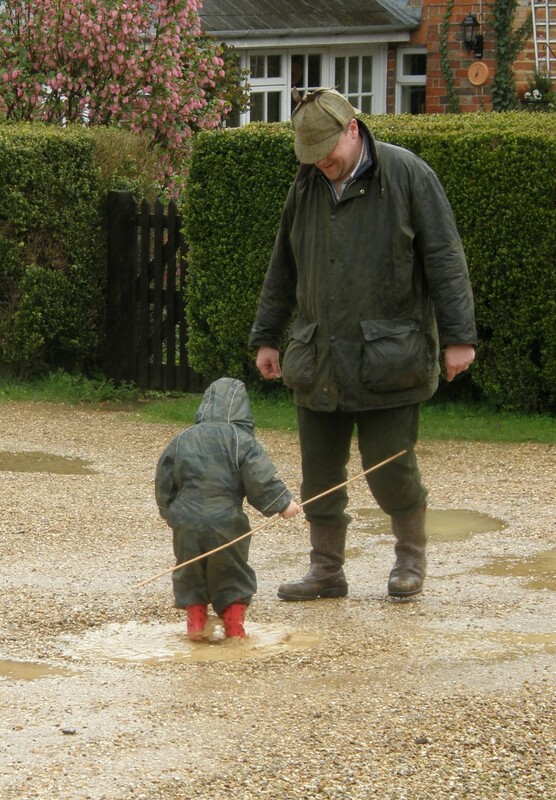 It’s been raining all day and I’ve been digging the vegetable garden, taking time out to splash in puddles with Scarlett (an activity she absolutely loves). But seeing how it’s the last day of the holiday, and that I’ll be back in the office tomorrow, I’ve had an irresistible urge to go out and watch badgers again before I swap my camouflage clothes for my pinstripe suit. 6.30pm saw me sitting against a tree at the north side of the sett. I don’t often sit here as the wind is usually in the other direction, but today it was blowing from the south of the wood, and the north side gives a good view of the big new spoil heap. The rain was steady. I sat on the damp ground with my camera tucked into one side of my open coat and my binoculars tucked into the other. My gear was nice and dry while I was getting nice and wet. I’d brought my camouflage umbrella with a vague idea that I’d set it up and sit under it, but I was sitting closer to the sett than I planned so I opted for a damp and inconspicuous low profile rather than comfort and left the brolly down. I sat there for an hour, getting steadily wetter. I really must get myself a pair of decent waterproof trousers one day (prospective sponsors please note!) The badgers failed to make any appearance. Badgers don’t seem too bothered by rain when they’re out foraging, but it does seem to keep them indoors later. Sensible beasts. By 7.30pm the light was failing, as were my hopes of an award-winning photo, or even of seeing a badger. I confess I was thinking of home, when the wind suddenly blew up, the rain started hammering down and somewhere in the wood there was a tremendous crash and clatter as a substantial branch broke off in the wind. Never mind the badgers – it was definitely time to head for home, through fields lashed by wind and rain. Hang on! Wait a minute! What am I doing? What am I thinking?! The obvious answer to badger watching in the rain, BWM old chap, is NOT TO DO IT! Stay at home. Drink tea. Watch TV. Read books. Don’t sit in a cold, dark, wet wood. They’re only badgers, after all. In the midst of this stark moment of clarity my beloved camouflage umbrella snapped in a gust of wind, and my disillusionment and misery were complete. Hi Mike – Very good advice as always! Yes, I really should get some new waterproof trousers. I have only myself to blame for having damp legs. And I need to find a better way to keep my camera dry than under my coat. And get a new inflatable cushion that doesn’t go flat every 20 minutes. in other words, I need to stop proving I’m a rough, tough outdoorsman who puts up with the discomfort, and put some effort into being comfortable for a change. I think I shall follow your example. I’m going to add my voice to the recommendations of waterproof trousers. As a recent convert, its amazing how much more cheery a damp and miserable world looks when you have nice dry legs and bottom. I have a nice cheap pair of plastic overtrousers that are all I need. Easy to get on and off, uncomplicated and really do keep me toasty. And you can stay out much longer in those circs. I also tend to always keep everything in drybags whatever I’m up to – even if it doesn’t rain you might fall in a pond! Have you thought about one of these portable hide things? I have, but haven’t come to any conclusion. Yes, you’re right. I do need some new waterproof trousers. In my defence, I do have three pairs already. My fancy gore-tex hillwalking trousers are too good (i.e. were too expensive) and too delicate to wear crawling round in a wood. My fishing bib and brace trousers are bombproof but far too heavy – they would take up most of my rucksack. And my old pair of cheap olive green nylons have more holes than the US Masters and are of doubtful waterproofing now (although after 15+ years I think I’ve got my £7.99 worth from them). I like the idea of a hide, but the lack of portability puts me off a little. It would be cosy though. I use two pairs of waterproof trousers for marshing: Gortex for summer use and Ventile for winter. I have been using these trousers for four years. I have a number of jackets: Gortex and Ventile are good; however, I need a really strong and bulletproof jacket for marsh use. My everyday marsh jacket is a Filson ‘Tin’ jacket, which is made from two layers of waxed canvas and is virtually indestructible. For footwear, it has to be wellies; normal boots last me less than a year. I discovered your website this evening and have read every word on it with interest. I suppose you could call me FWM-Fox Watching Man, or just Steve will do! Last Year We moved to a fairly rural area near Wrexham, North Wales and I walked every evening around the fields and woods to get to know the area. One evening my golden labrador aptly named Marley was walking ahead as usual and I noticed him tilting his head in what seemed to me like absolute shock at what he was seeing. For the first time in our lives Marley and I were face to face with two foxes! Like you said when you first encountered the Badger, I was hooked! I have been following the foxes for over a year now and a few months ago they lead me to their den. As I was taking in the scene of the habitat I was suprised that just two foxes (soon to be more hopefully) would have a den with over 20 holes, they were all around me, everywhere I looked was another hole………….then it occured to me where I was standing…………I ran like hell!!! I had always had a slight fear of badgers and I couldn’t really tell you why because I have never seen one! I guess it’s the stories that you hear about how a badger can practically take down a bear or write off your car if you hit one! When I eventually calmed myself and got my head around the fact I had been standing smack bang in the middle of a badger sett, I decided to go back for a sneak peak just to be sure.When you know what you are looking at, you know what to look for, I could plainly see the dung pits, the little holes that had been dug for worms and tracks and prints everywhere! This was definately a case of badgers and foxes cohabiting! Apparently it is also quite common for foxes and badgers to share a sett/den, they each use a different area of the sett! From looking at it the badger sett has been there for many, many years and the foxes are just squatting there until the cubs are old enough to leave, then the foxes will resume living above ground. I know the foxes well enough by now to predict where I will see them and at roughly what time, however I just havn’t managed to pluck up the courage to sit and watch the badgers, I found the sett which is active with both animals over 4 months ago and I have yet to experience a badger! I guess their reputation goes before them. I guess i’m just concerned they will attack me as silly as that may sound to you 🙂 I have a pretty o.k set of binoculars which I suppose I could use to see the badgers from a safe distance-I’ll let you know how I get on! And thanks for your kind comments too. It’s always good to hear from someone else with the same sort of obsession. I’ve met a few through this site, and you’re right – it’s good to know we’re not alone. Thanks for sharing the story of the foxes. I can quite understand. As I’ve said, it was a chance encounter of my own that led me down this path, so I know they can have quite an impact. And I do have a soft spot for foxes too. When we lived in London I used to get in terrible trouble from Mrs BWM because I fed the urban foxes – they made an awful racket. I thought we had one or two visiting the garden until I sat up and watched one night and saw six at once, all arguing over the bowl of cat food. We don’t get nearly as many foxes out here in Bedfordshire. I suspect one reason is that this is pheasant-rearing country, and the keepers aren’t too keen on foxes and they don’t share my sentimentality. But I still like to watch foxes when I come across them. We had a den of foxes in a disused hole at the main badger sett a couple of years ago, and the cubs were great fun to watch as they played and gained confidence. I’ve a video of them somewhere on here (https://badgerwatcher.com/2009/05/10/fieldnotes-10th-may-2009-more-fox-cubs/), and it’s still one of my favourites. As for the badgers, I wouldn’t worry about them. They’re highly unlikely to do anything more than run away if they see you. I’d say to get out and try to see them, especially now that any cubs will be coming out. The binoculars are a good idea, not to keep you at a safe distance but to allow you to watch from where you won’t risk scaring the badgers. Failing that, there are a lot of advantages to climbing a tree (although badgers are suprisingly good climbers for such bulky animals, they can’t get far up a vertical trunk). Anyhow, thanks for taking the time to write, and do let us know how you get on. Ventile Mike? Very nice indeed. Makes me even more ashamed of my £7.99 specials. By the way, I love the word ‘marshing’. It’s a great way of describing what you do. Hi BWM, Thanks for the reply! I can imagine there won’t be many foxes to see if you live in a pheasant rearing area. The sett I visit is only approx half a mile from a remote farm so im quite suprised we still have foxes there however the farm is mainly cattle and you don’t hear many stories of a fox taking down a bull 🙂 I suspect the farmer himself is a keen badger watcher as I noticed a few months ago that he had cut a clearing in the bushes (only 10ft wide or so) on the edge of his field, when I looked through where he had cleared, it was right near the sett, a birds eye view if you like of the sett as it is lower down the embankment in a wood clearing. I have seen him there a few times and always wondered what he was doing, I guess I know now! It’s good to know that not all farmers are keen to shoot everything that doesn’t belong to them! In fact I would go as far as to say that he is encouraging wildlife to be present, he has nesting boxes all over the place around the sett and the habitat in the middle of a wood clearing looks too perfect for badgers, foxes and all wildlife to have occured naturally, I suspect he has built himself a little ‘Eden’ if you like, a perfect place for the animals. It also helps the animals that it is in the middle of nowhere, miles from any busy roads and houses. I have also never seen another person at all near there (except the farmer), an indication as to how remote it is! I think your website has convinced me to try and see the badgers, I will use your graph to try and narrow down the most likely times to see them. Do you think the size of the sett is an indication of numbers using it? As I mentioned there must be in excess of 20 holes there although I will say that some look to have been there alot longer than others. I will let you know how I get on and hopefully I can take some good pictures too! It sounds like an idyllic spot there, and it’s always good to hear that there are people out there taking good care of the countryside. As for the size of the sett, I think it’s good for a general idea, but not foolproof. The number of active holes is the key (rather than just any holes), but even this isn’t definite.